In this Chapter, the basic iterative solutions for linear discrete systems will be presented. The iterative solutions of the linear discrete systems with distinct and repeated eigenvalues will be discussed. The stability of linear discrete dynamical systems will be discussed from the oscillatory, monotonic and spiral convergence and divergence. The invariant, flip and circular critical boundaries of the stability on the direction of the specific eigenvector will be classified. The lower dimensional linear discrete systems will be discussed to show stability and stability switching. In this Chapter, basic concepts of nonlinear discrete systems will be presented. The local and global theory of stability and bifurcation for nonlinear discrete systems will be discussed. The stability switching and bifurcation on specific eigenvectors of the linearized system at fixed points under specific period will be presented. The higher order singularity and stability for nonlinear discrete systems on the specific eigenvectors will be presented. A few special cases in the lower dimensional maps will be presented for a better understanding of generalized theory. The route to chaos will be discussed briefly, and the intermittency phenomena relative to specific bifurcations will be presented. In this chapter, to understand complexity of chaos in dynamical systems, the multifractality of chaos generated by period-doubling bifurcation will be discussed via a geometrical approach and self-similarity. A bouncing ball model will be discussed to show how to construct discrete maps in practical problems, and the stability and bifurcation of periodic motions for the bouncing ball will be presented analytically. Positive and negative dynamics of discrete maps will be discussed, which is a base for the compete dynamics of discrete dynamical systems. The theory of the complete dynamics can be developed from the Ying-Yang theory in Luo (2010). The complete dynamics of a discrete dynamical system with the Henon map will be discussed briefly. 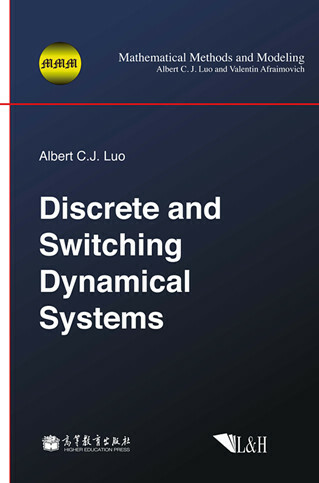 In this chapter, dynamics of switching dynamical systems will be presented. A switching system of multiple subsystems with transport laws at switching points will be discussed. The existence and stability of reference points in switching dynamical systems will be discussed through equi-measuring functions. The G-function of a flow to the equi-measuring functions in the switching system will be introduced. The local increasing and decreasing of switching systems to equimeasuring functions will be presented. The global increasing and decreasing of the switching systems to equi-measuring functions will be discussed. Based on the global and local properties of the switching dynamical systems to the equimeasuring function, the stability of switching systems can be discussed. A frame work for periodic flows in switching systems will be presented. The periodic flows and stability for linear switching systems will be discussed. This framework can be applied to nonlinear switching systems. Stability and bifurcation of periodic flows in nonlinear switching systems can be discussed in a similar fashion. In this chapter, mapping dynamics and symmetry in discontinuous dynamical systems will be discussed. The G-function of the discontinuous boundary will be presented first. To understand of nonlinear dynamics of a flow from one domain to another domain, mapping dynamics of discontinuous dynamics systems will be presented, which is a generalized symbolic dynamics. Using the mapping dynamics, one can determine periodic and chaotic dynamics of discontinuous systems, and complex motions can be classified through mapping structure. The nonlinear dynamics of a suspension system with MR damping will be discussed as an example. With different velocity, the MR damper will change damping forces to cause the suspension system to be discontinuous. Using the mapping dynamics, the periodic motions of such suspension systems will be presented.